Dear Lord, I’ve been accused of being many things–but never a real estate pimp! SHUDDER! But I have to admit, I see your point: how could a home buyer not be drawn to Floyd County by all the insect photographs I’ve posted this summer. Almost seems unfair, knowing how deep a tug insects have on homeowner’s hearts. I feel so ashamed. I’ve been branded before in my effusive blog-of-place as a “retiree magnet” to our area, and if this is the case (and I don’t really think it is) it certainly isn’t by design. I’d be finding the curious, beautiful and inspiring ordinaries no matter where I lived at this time of my life. It just happens that I live in a rather pleasant place at a time when pleasant places are getting harder and harder to find. People do seem to gravitate to story-book locations, often to find the story is not nearly as rosy as it at first seems. 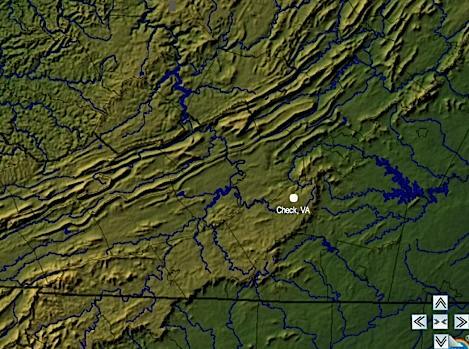 Matter of fact, we have our own woes in Floyd County, Virginia, and water quality and quantity are near the top of the list. We are in the 10-20% normal rainfall band this year, better than last and way better than 2003. The problem is, our water runs in fractured granite, not in the limestone caverns of the Ridge and Valley province to our north. The storage capacity is limited and quantity unknown as evidenced by the large number of wells that have run dry (even this summer) and the depth to which new wells are having to be dug. We have a population cap in the county and water will be a limiting factor, as will corrupted ridgeline views covered with summer chalets; and there are the peaceful back roads incompatible with the bulldozers you mentioned. We lack a lot of things most city dwellers would demand–unless they only plan to come visit a few days, enjoy the amenities, drop some cash, and go home. I’d be happy to entice tourists to visit, far less so to draw unprepared dreamy homesteaders to a big lifestyle mistake. I appreciate your mission and voice at Waterblogged. Do keep up the good work and good words!